Trip of a lifetime. Bucket list. Must see before you die. Unforgettable. These are all words and phrases that describe many people thoughts when you talk about possibly planning a road trip to Iceland. And here’s the thing: Iceland does not disappoint. It definitely lives up to the hype. Now don’t get me wrong; it’s not some perfect vacation utopia. It’s relatively cold and can get quite windy. But weather problems aside, renting a car and hitting Iceland’s Ring Road is certain to be an experience you won’t soon forget. So what makes Iceland so special? And why is it such a good idea to take an Iceland road trip? Let’s find out! Here’s a clue: it involves lots of outdoor activities and natural wonders like careening waterfalls, fiery volcanoes, icy glaciers, breathtaking black sand beaches, and stunningly gorgeous landscapes everywhere you like. There’s a reason Iceland’s tourism industry has grown exponentially in the last few years. While you are roaming and enjoying the freedom of the open road, be careful not to get distracted. More than one dreamy-eyed driver has gotten into a collision because they were so busy admiring the landscapes that they forget to focus on the task at hand. In a place where you can see natural landscapes like Skogafoss waterfall or the onyx-like basalt cliff faces of Snaefellsnes peninsula from the road, it’s understandable that you wouldn’t want to keep your eyes facing forward. But driving in Iceland is a special undertaking, and you need to practice every precaution. It also goes without saying that if you want to take a picture, pull over. Don’t block the road and be mindful of other drivers. Luckily for you, most of Iceland’s most spectacular landscapes are off of the Ring Road. The Hverir Geothermal area with its Mars-like terrain, the midnight-hued beaches of Vík and Reynisfjara, and Iceland’s stunning Seljalandsfoss and Svartifoss waterfalls and just a few that immediately spring to mind. Wow, where to start. Want to explore an otherworldly, turquoise blue glacier cave in Skaftafell? What about a frosty ice cave? 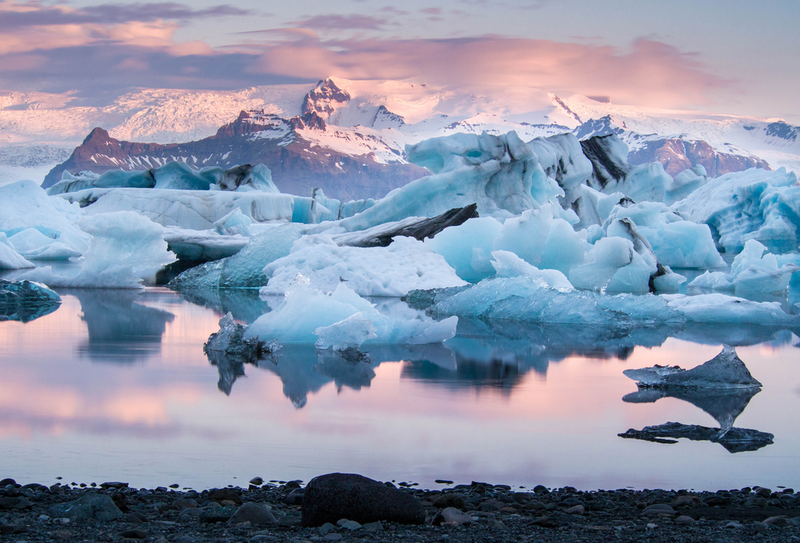 Or perhaps glacier hikes or glacier lagoons like Jokulsarlon are more your speed. Vatnajokull National Park has some pretty neat things to do. There’s also hiking in the colorful Landmannalaugar area as well as soaking in hot springs. Be sure to pay a visit the the Blue Lagoon and enjoy the healing and restorative powers of its silica-infused water. And for animal lovers, summertime brings whale watching excursions along the coast in places like Husavik as well as puffins building their colonies. You could say that Iceland was made for road trips. It has a Ring Road (Route 1) that circumnavigates the entire island and hits most of its major sights. Just head out of Reykjavik and see where your vehicle takes you! Whether traveling clockwise or counterclockwise around the Ring Road, having a 7-day or 8-day itinerary is not only the perfect amount of time for a road trip, it’s enough to give you a taste of this amazing Nordic Country. Plus, everyone speaks English (and we’re quite friendly), so there’s no need to worry about a language barrier. So there you have it! I’ve laid out my argument about why Iceland should be your next road trip destination. What do you think? It’s definitely something different and unlike anything you will experience anywhere else on earth. What are you most excited about seeing and doing in Iceland?